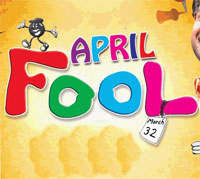 April Fool’s Day, sometimes called All Fool's Day, is on the first of April every year. People can play practical jokes. That's why you shouldn't believe what is said to you and you should be doubtful of the people around you on this day. Someone might change the time on another person's alarm to make him wake up very early or very late. Or she / he may put a lot of pepper in another's food. Of course all this is done just for fun. when the trick is played people say "April Fool" to make the poor person realize that it was just a joke. Some of the well known and most successful pranks or practical jokes were on the media - television, radio stations, newspapers... For instance, a BBC television program ran a famous hoax in 1957, showing Italians harvesting spaghetti from trees. A large number of people contacted the BBC wanting to know how to cultivate spaghetti trees. In 2008, the BBC again reported on a newly discovered colony of flying penguins showing people walking with the penguins in Antarctica, and following their flight to the Amazon rainforest. April Fool's Day is also called Fool's Day ? After the announcement of the BBC "spaghetti documentary"